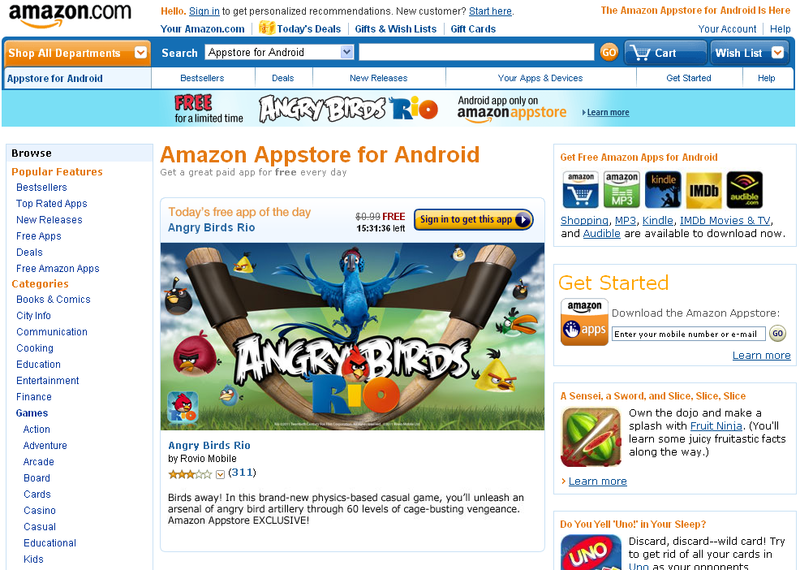 Amazon has launched an Appstore for Android apps. Their unique offering includes a free paid app of the day with today’s offering being Angry Birds Rio, exclusively from the Amazon Appstore. Other announcements include that Amazon will sell ad-free versions of Angry Birds. Another feature of the Amazon Appstore includes the ability to Test Drive applications which runs the app virtually in the Amazon Elastic Compute Cloud infrastructure. To get started with the Amazon Appstore, you can visit the Amazon Appstore from your computer. Then submit your phone number for an app you’d like to purchase (or get for free). This will text you an address to visit from your phone (http://amzn.to/getappstore) which will download the Amazon Appstore Android package. From there, you install the Appstore and can start shopping. Visit this Amazon page for a full walkthrough of the install process. The Amazon Appstore is currently incompatible with AT&T Devices but is being addressed by AT&T. Amazon Appstore apps are only available to customers located in the United States, and some apps will only work on an Android device that has root-level permissions. “You should only download these apps if you are certain your device is rooted. Amazon.com does not encourage you to root your phone.” For more information on the Amazon Appstore for Android, view the related Amazon.com Help page. The Amazon Appstore has a Developer Program for developers to submit their apps. The developer program normally has a $99 program fee per year but Amazon is waving that cost. Amazon will pay developers 70% of the sale price of the app or 20% of the list price, whichever is greater, and payout can occur via EFT for US developers monthly after $10 are earned. Amazon uses DRM for its apps but it is not required by Developers to use the Amazon digital rights management software. You can find more information in the Developer Portal FAQ. Apple is slapping Amazon with a trademark infringement lawsuit over the term ‘appstore’, so we’ll see how the dust settles. For now, I’m getting Angry Birds Rio and I know how the rest of my lunch break is being spent. Amazon.com, Inc. (NASDAQ:AMZN) today announced the launch of the Amazon Appstore for Android at www.amazon.com/appstore. Customers can now find, discover – test! – and buy Android apps using the convenient shopping experience that Amazon customers know and love. An innovative new feature called “Test Drive” will enable customers to test apps on a simulated Android phone. Customers control the app through their computer using a mouse. Is Apple Downplaying Today’s ‘Let’s Talk iPhone’ Event?